As you drift upstream, taking in the lower Noosa River, cruising through Lake Cooroibah and past the fresh waters of Lake Cootharaba, you are experiencing the diverse waterscapes of the Noosa Everglades. Overhung by mangroves and tangled vine forests and filled with fish and frogs, these scenic stretches of calm water can be explored with guided river tours, aboard your own vessel or with a hire boat or canoe. Campers can also travel by 4WD to stay at Harry's Hut camping area. The Aussie World theme park is located alongside the iconic Ettamogah Pub and has thrilling rides and games including water ride Plunge, thrill ride Redback, and fun Giant Slide. The Ettamogah Pub is probably the most photographed pub in the world due to its quirky appearance and Bluey's Bar and Grill upstairs serves up huge fair dinkum meals. On departure from Aussie World is a fabulous gift store where the pleasure of browsing through some of the most unique gift lines on the Sunshine Coast can be found. Check out Australia Zoo - it's the WILDEST show on Earth! We pack in stacks of wildlife action every day and move at a great rate of knots - there are always plenty of exciting wildlife shows to see, friendly zoo keepers to chat with and heaps of drop-dead gorgeous animals that can't wait to get up close and personal with YOU. See the Australian Nougat Company hand make soft -melt in your mouth, French style nougat, with macadamias at Eumundi. The Australian Nougat Company has manufactured Macadamia Bliss Nougat on Queensland's Sunshine Coast for 25 years. Hand made using all natural ingredients, you will find no artificial colours, flavours, or preservatives in our recipe! All 13 flavours are Wheat and Gluten free. Race by day or by night - get ready for an adrenaline rush! Big Kart Track is the largest and fastest commercial go-kart track in Australia. Challenge and test your skills on our 1200m long racetrack with our 50 Go-Karts, it is sure to be an experience you will never forget. We even have a separate kids track! Book a party in our fully themed venue exclusively holding up to 200 people. We can organise anything from catering to personalised trophies. Big Kart Track is open 7 days - 9am until 5pm Monday to Thursday and every Friday and Saturday until 10pm. For more details check out our website. See you on the track for some fun! You'll find original artworks, sculptures, furniture, handmade toys, homewares, and skincare, as well as cutting edge fashion and jewellery by local designers, all guided by our ethos of "we make it, bake it, grow it, sew it"
The community-owned Majestic Theatre, one of Tourism Queensland's 150 Must-Do's for 2009, presents regular screenings of silent films. In true 1920s style, our regular screenings of silent films are presented with live accompaniment on a Compton pipe organ...as well as a variety of live performances and community events. The heritage-listed theatre was fully refurbished in 2007. While the golden age of silent cinema lives on at the Majestic, business seminars, wedding ceremonies & receptions, birthday parties, corporate conventions, community concerts & events, dance parties and specially themed film nights are all possible. Call us to discuss your needs today. The Noosa Ferry Cruise Company operates a daily ferry cruise service between the historic riverside town of Tewantin and along the beautiful waterways past Noosaville (with great views across to Noosa's north shore) and Noosa Sound into the heart of Noosa Heads with its famous beaches shopping eateries and national park. 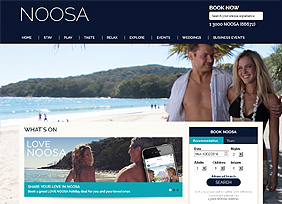 The Noosa Ferry operates seven days a week with evening services every Friday and Saturday. The Noosa Ferry also offers a fantastic pre dinner cruise the Noosa Ferry Sunset Cruise Tuesdays to Saturdays inclusive. Both cruises are $20.00 each for an adult fare. The Noosa Ferry is also available for private charter, weddings, special occasions, corporate events and transfers. As one of the Sunshine Coast's largest and most popular tourist attractions find out why millions of visitors keep coming back to the Ginger Factory. There's so much to discover, taste, see and do! Drop in and enjoy educational tours, entertaining rides, great shopping facilities and a whole lot of fun. Dine at the all-new cafe with an ever-changing menu featuring the region's best produce. The Ginger Factory is the perfect year-round destination to discover the real taste of Queensland's Sunshine Coast. UnderWater World, an all weather aquarium on the Sunshine Coast. Boasting Australia's best seal show and Queensland's largest Oceanarium with thousands of marine animals plus more than 14 presentations daily.